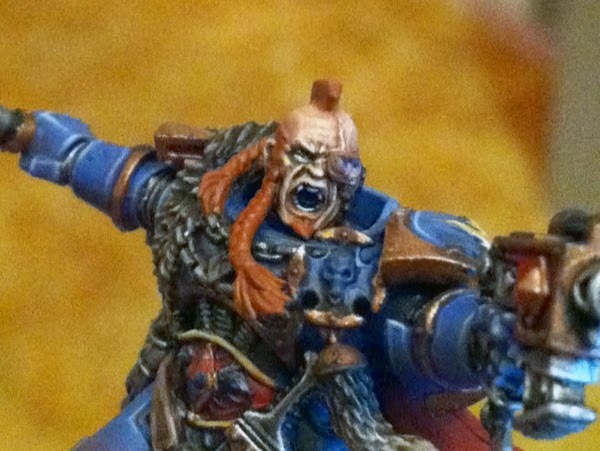 Today I take a look at my method for painting caucasian skin. I use this or something similar to this for every model I have painted with bare skin. The face is the focal point of your model, which generally means you want it to be really, really good since everyone will be drawn to it. 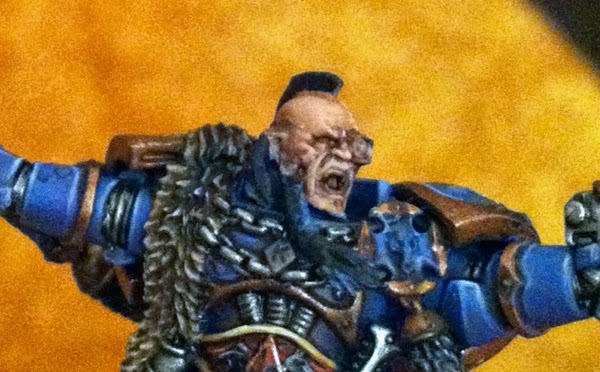 For me painting the face is often one of the most rewarding parts of the model. You really get to see the mini come to life after it's done. So lets get started. To start off I made sure I gave the face a nice solid basecoat of Tallarn Flesh. This is an older color and GW says that Cadian Fleshtone is the newer equivalent, but it's actually slightly lighter and pinker. It should work the same though. You want to make sure the coat is as solid as you can get it here. I did several layers before I was satisfied. 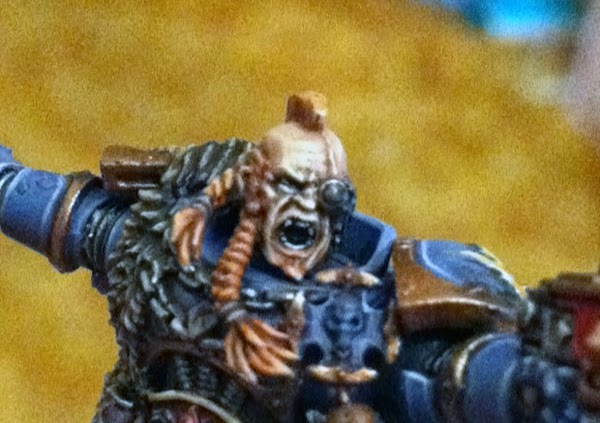 Next up the whole face got a wash of Riekland Fleshshade, nothing fancy here. For the third step I took some Rhinox Hide and watered it down to the consistency of a shade. I then put this into the recesses of the most prominent areas of the face such as the eyes, nose and mouth. This is going to be much darker than the Fleshshade so make sure you only use it on areas you really want to draw attention to. Now you need to go back over all of the raised areas on the face and re-layer them. I did a mix of Tallarn Flesh and Cadian Fleshtone. If you used Cadian Fleshtone as your base color you can mix any other flesh color in that is slight lighter. 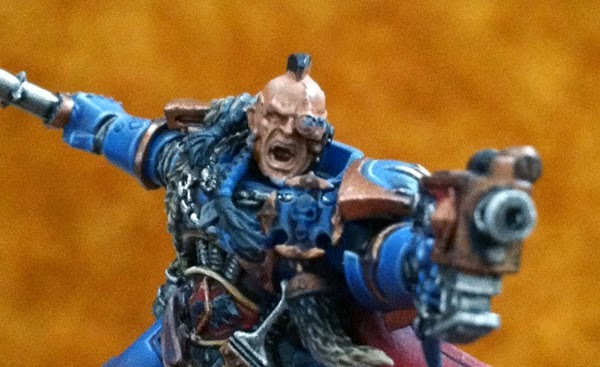 GW claims that Ratskin Flesh is equivalent to the old Dwarf Flesh, so that might work. All I was trying to do was add some more color into the skin. Make sure you leave the darker colors showing in all the recesses. This stage starts the fine highlighting. I mixed in Ushabti Bone to the mix from my previous stage and started highlighting all of the raised areas. This included a line going along the side of his shaved skull and worry lines on his forehead. Since this is the first highlight you want to be as broad as you can, that means highlight everything you think needs it. You still need to keep the highlights themselves thin and controlled though. Mix in more Ushabti Bone and highlight a smaller area than before. At this point I was using pure Ushabti Bone and only highlighting the most prominent area such as his brow, nose, cheek bones, mouth and scar. These need to be your thinnest highlights. Even though I only showed 3 steps for the highlights you can do as many as you need. I think I may have actually done around 4 stages on this guy. The more stages you do the smoother your transition between your highlights will be. You could call it done at the last step but if not there is still more you can do. I always like to add in some color to the face, it really gives it life. If you look at real skin you can see that it is translucent, not opaque, and you can see reds and blues showing through. To get this same effect I mixed in some Tuskagor Fur into the Cadian Fleshtone to get a reddish hue and watered it down a lot. I then used this as a glaze on the lower lip, the scar, and a little bit on the bridge of the nose. If you are painting hands I also do this on the knuckles of models. 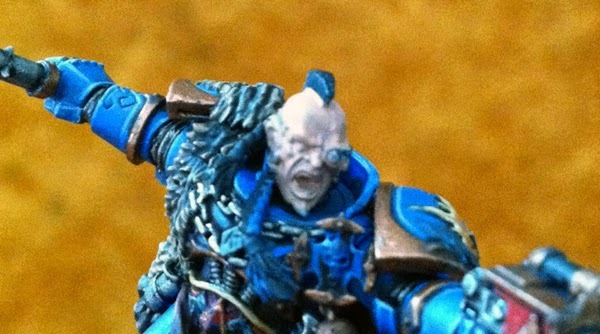 The eyes then got a similar treatment with a mix of Sotek Green and Cadian Fleshtone. You mostly just want to focus this on the lower eyelid. I also you Carroburg Crimson instead of the red mix sometime and Druchi Violet or Drakenhof Nightshade in place of the blue mix. 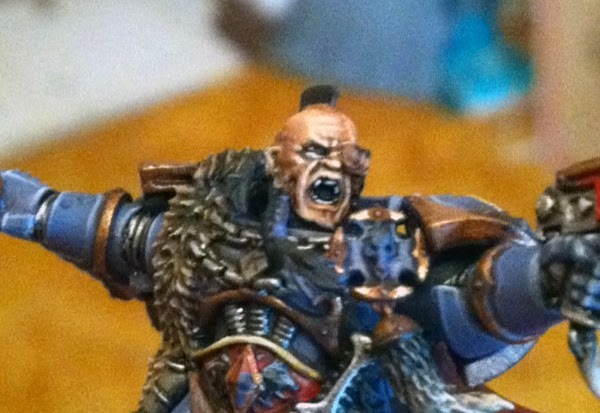 These areas were than re-highlighted with Ushabti Bone and the mouth and eyes were painted black. The eyes were then painted white making sure to leave a line of black around the edge and then dotted with black. 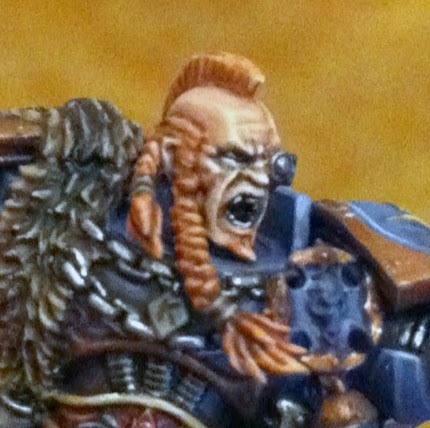 I also painted the teeth with white and then checked to see if there were any areas I needed to touch up. 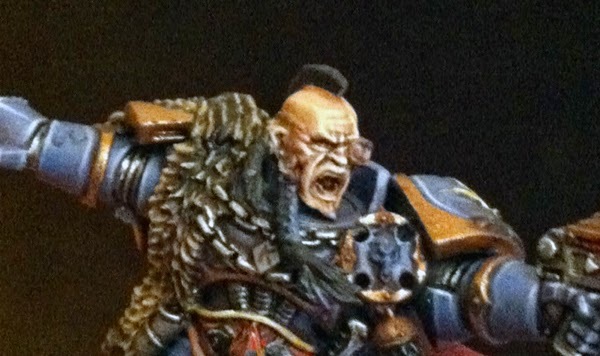 I believe on this guy I re-darkened one of the creases on his face and softened another area that was too dark. To do that I just watered down some Cadian Fleshtone and used it as a glaze only in the very small area I needed it. 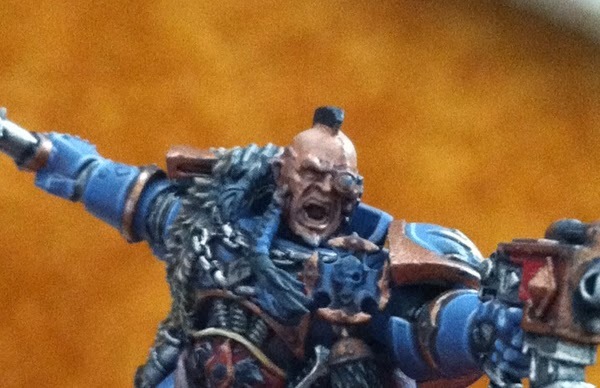 If the model has hair it might be worth at least basecoating it at this point. This is to make sure that you didn't miss any areas you thought might be hair and were actually skin. It also might change the way things look slightly by having another color next to it. Paint the hair if you want and you're done! 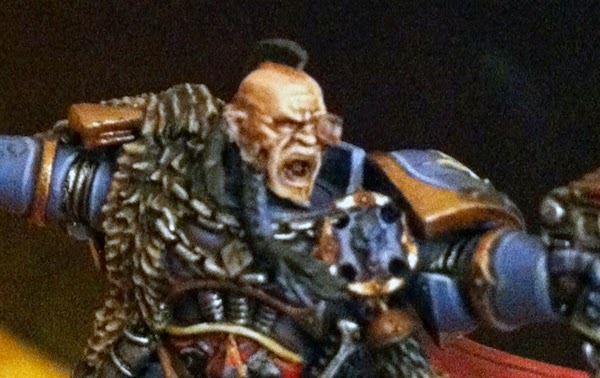 These same techniques can also be applied to other areas of skin on models, but the larger and flatter the surface area the more smooth and subtle you need to be with you highlighting and shading. I hope this was helpful to everyone out there. 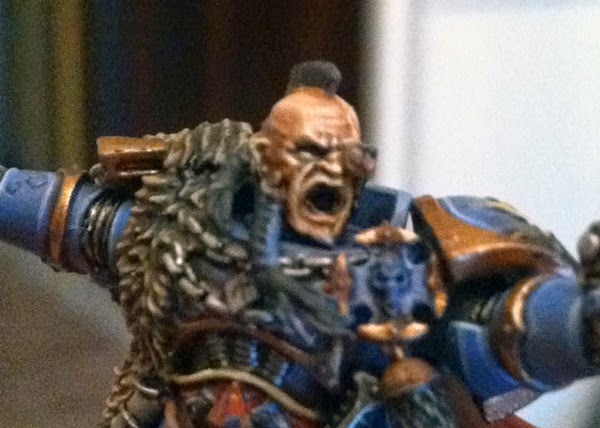 To me the face is one of the most fun and rewarding things to paint, but it can also be stressful if you make mistakes since it is such a small area. Just remember that it is easy to go back and fix anything while you're painting. 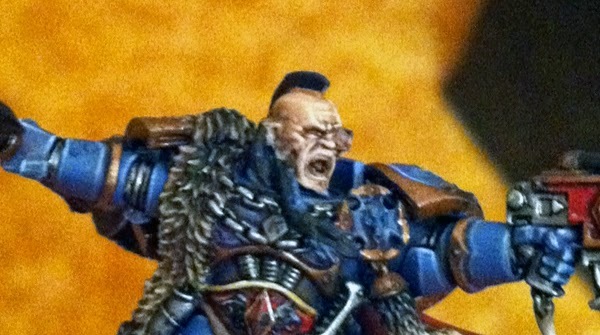 You may have noticed that this model is the Space Wolf Captain, Krom Dragongaze, from the Stormclaw box. At the time of me writing this article he is still a work in progress, as you can hopefully tell from the several unfinished areas on him in the pictures. Look for a post about the finished model later this week. It really is a nice model and it's a shame that they made him limited edition.